Walking with Dinosaurs Trivia Giveaway Day 2! Hello all my favorite Little blog reading dinosaur lovers! Jerm here with day 2 of the Walking with Dinosaurs trivia giveaways. Yesterday we had a strong response on Twitter for these tickets and I expect today to be no different! Now for those of you who were not paying attention yesterday, let me tell you what you are playing for! 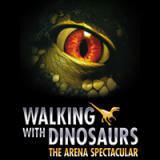 The famous Walking with Dinosaurs Tour will be here October 14-18 at the St. Pete Times Forum here in downtown Tampa. I have two 4 packs of tickets to give away for today and tomorrow. We gave away 4 tickets to a lucky winner yesterday and will be doing the same thing to day for you, our favorite Facebook fans! Remember, with these giveaways, you HAVE to be a fan of the Visit Tampa Bay Facebook page (www.Facebook.com/visittampabay). Then, once we post the trivia question, you have to be one of the first 10 to respond via the comments section where we asked the question on Facebook with the correct answer for a chance to win. Alright guys, here goes nothing! This ancient period, which followed the Jurassic period, is believed to be the period in when new carnivore groups developed including the Tyrannosaurs, Spinosaurs and Dromaeosaurs. Who is the Creator and BBC Series Producer of ‘Walking With Dinosaurs’? Okay, I guess you guys should get to guessing. Remember there are four of these tickets on the line!